In light of Donald Trump’s win and the GOP hold of all three branches of government, the question on most minds today is, what is the outlook for the US economy? My short answer is that it is too early to tell. 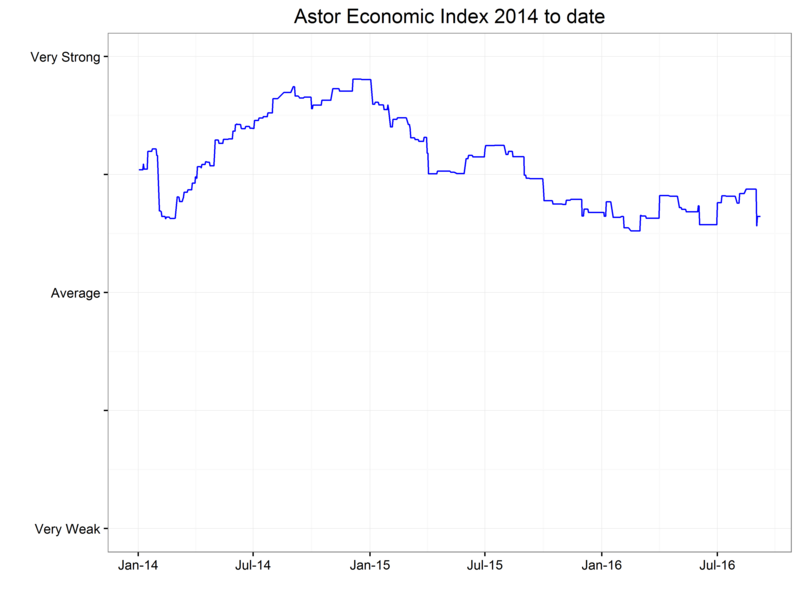 At Astor, our philosophy is to be guided by actual economic data rather than forecasts. 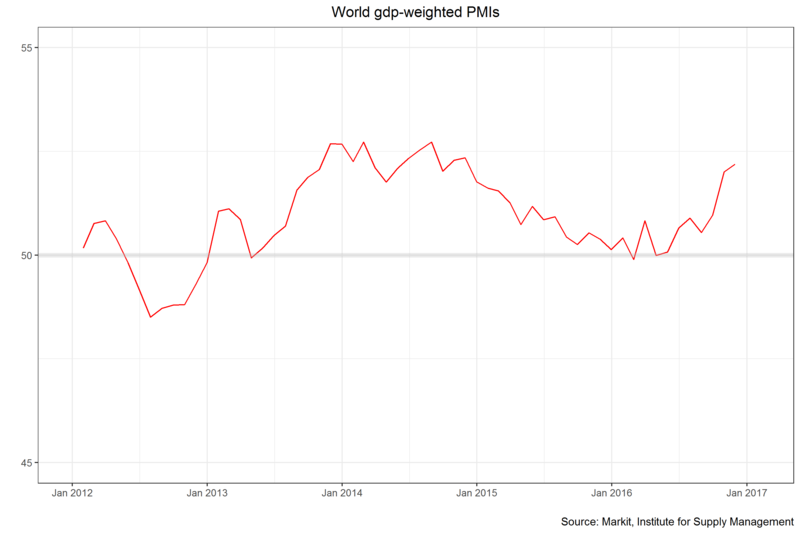 Nevertheless, it is important to think about possible implications for the U.S. economy. The economy came into the election on an extremely stable path. 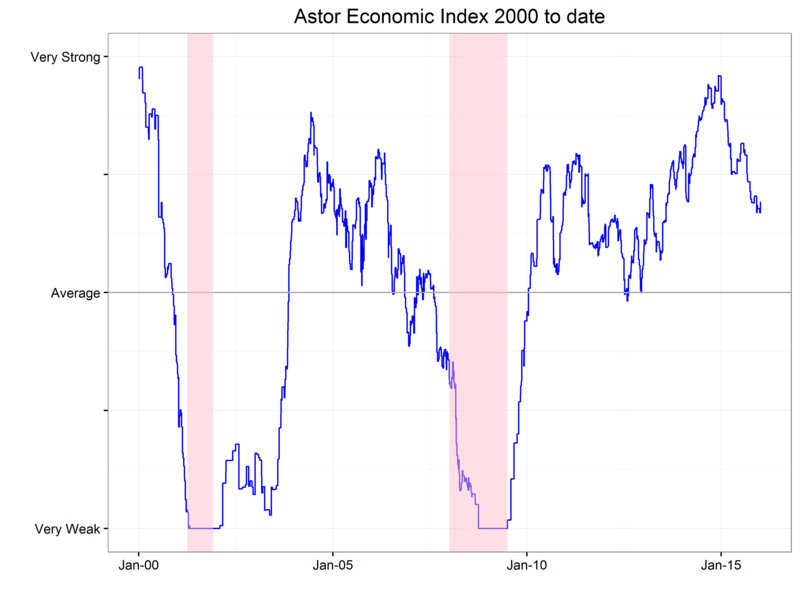 Our Astor Economic Index®– a proprietary index that evaluates selected employment and output trends in an effort to gauge the current pace of US economic growth–has been steadily showing modest, but positive, growth all year. Indeed, it has been in an unusually narrow range recently suggesting to us that fundamental dynamics of the US economy are stable. In the next days to weeks the heightened uncertainty caused by both the unexpected outcome and the unknown policies of a Trump presidency seem likely and the stock market tends to dislike uncertainty. The nontraditional nature of Trump’s campaign means that there are few coherent, detailed policy commitments to game out. Trump has held a variety of opinions on most matters and will have to work with Congress, which may feel emboldened by his political inexperience. Discontent over the US trade position has been Trump’s consistent theme. Much trade power has been focused in the executive branch, leaving the new President some leeway to act without Congress, subject to court review over an extended period of time. Given what Trump has said about his negotiating style, it would not be surprising to certainly see some eye-catching headlines about withdrawing from NAFTA. Trump has repeatedly called for a 35% tariff on Mexico and 45% on China, which he may be able to impose at least for a few years unilaterally. This will reduce trade broadly and disrupt international supply chains. For more on Trump’s views on trade see this article from the Peterson Institute. The authors point out that using standard economic models, a full trade war (where the US raises tariffs on other countries that can then retaliate in kind) could on its own cause GDP growth to be as much as 2.9 percent lower per year for several years. his same paper estimates that an aborted trade war, which they operationalize by saying tariffs are imposed only for year before reverting to previous levels, could have a small stimulative effect on the economy. The future may be somewhere in between. In my opinion, the reality of substantively reduced trade would likely also be a weaker dollar and higher inflation in the medium term in addition to lower GDP growth. It seems that the broader multilateral free trade deals such as the Trans Pacific Partnership will not be brought to Congress. Early on it is possible that repudiation of as much of the Obama legacy as possible could be the GOP first order of business. As observers have noted, that may mean repealing Obamacare and reducing financial regulation such as Dodd-Frank and the Consumer Financial Protection bureau. One thing all Republicans agree on is tax cuts—and that, in our view, could be the single most likely outcome. Both Trump’s and speaker Ryan’s plans skew cuts toward the wealthy. Trump agreed with his opponent that increased infrastructure spending is necessary, but that may prove harder to get through Congress. It is not clear if Congress will make substantive spending cuts to pay for the increased fiscal spending. This has the potential of being stimulating to the economy, but if unfunded could cause bond yields to move higher quickly. Turning to the Fed, where is its promise to raise rates in December? Much will depend on the reaction of markets between now and the next FOMC meeting in a month. Should markets recover and treasury prices stabilize the Fed may still raise rates a quarter point in December. Should the new administration’s plans crystalize to substantial fiscal spending the FOMC may see the need to raise rates preemptively. Janet Yellen’s term as Chair of the FOMC expires January 2018. Trump has both praised and condemned Yellen this year, but it seems likely in our view that he would prefer to install someone new as chair. In addition, there are currently two open seats on the board of governors giving the new administration a chance to move the Fed. My sense is that the rest of the GOP would prefer a more hawkish Fed and without a strong campaign promise to fulfill Trump may accede to their wishes. Overall, I expect no large changes in unemployment or output over the next few months as a result of the election, but the increased uncertainty may lead to a challenging time for all assets until some clear signals emerge from the new administration. As always we will wait to see changes showing up in the economic numbers before adjusting client portfolios and will use our time-tested process to guide us whatever occurs. All eyes are on the Federal Reserve this week and the often-discussed question: Will they or won’t they raise rates? Here at Astor, our prediction of what we believe the Fed will do (spoiler alert: we don’t expect a rate rise in September) comes down to two important data points: employment and inflation. These data points relate directly to the mandate of the Federal Open Market Committee (FOMC) as stated in The Federal Reserve Act, particularly to promote the goals of maximum employment and stable prices. In the chart below, the blue horizontal band represents the inflation target (roughly 2%) as set by the FOMC, while the pink vertical band shows the unemployment rate (roughly 5%). We can see that as of August 2016 (far left), the Fed has made progress in fulfilling its mandates. The unemployment rate has been cut in half, from the high of 10% in October 2009 (in January 2010 it was still a lofty 9.8%) to 4.9% in August 2016. Inflation, meanwhile, has been not been above the Fed’s target for more than a month or two. Looking ahead, the question that we believe is on the collective mind of the Fed is what will happen a year or two out, particularly with unemployment being so low. Will a relatively tight labor market lead to higher wages and, in turn, force inflation higher, above the Fed’s target? Recent speeches and comments made by central bankers seems to us an FOMC that is divided on this issue. The “hawks” have been making their case for raising interest rates; in their view, with unemployment being so low, inflation looks certain to increase. For instance, earlier this month, Federal Reserve Bank of Boston President Eric Rosengren said “a reasonable case can be made” for tightening interest rates to avoid overheating the economy. Here at Astor, our analysis of the Fed’s comments is that the FOMC will refrain from raising rates in September. (We’re not alone in that view: As the Wall Street Journal reported, the widespread expectation in the market is for rates to stay steady.) Come December, though—a full year after the last rate hike, and with another quarter of economic data to digest—we believe the Fed will take the next step and raise rates. I interpreted last month’s economic releases as somewhat weaker. Forward looking surveys were concerning though consumer spending in the US, the most important single component of GDP, seems to be stable. 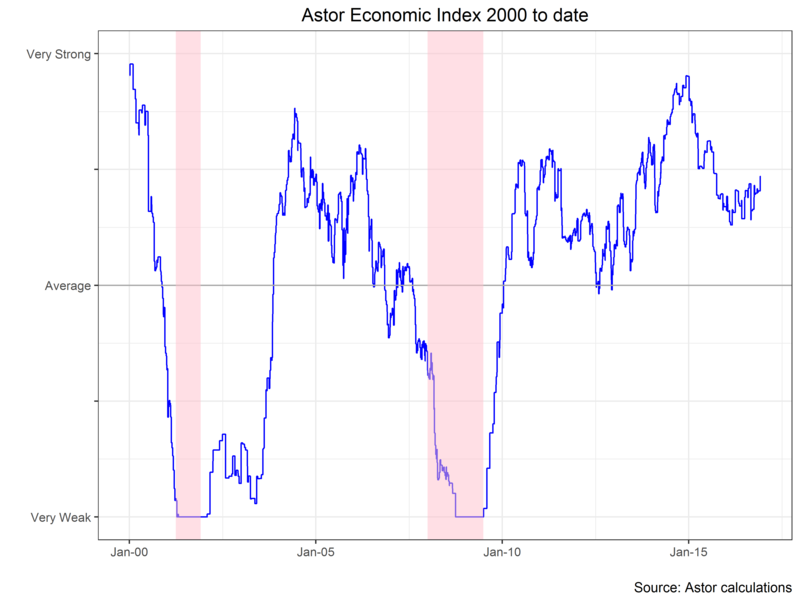 Our latest reading for the Astor Economic Index® (“AEI”) is lower over the month, though I see no discernible trend over the last twelve months. I still see the US as currently growing above average. The AEI is a proprietary index that evaluates selected employment and output trends in an effort to gauge the current pace of US economic growth. The nowcasts produced by the Federal Reserve banks of Atlanta and New York are both still showing stronger growth in the third quarter than the first half of the year. The Atlanta Fed is currently estimating a gaudy 3.3% SAAR and the New York Fed is currently forecasting 2.8%. These are both significantly stronger than their final Q2 estimates and represent a significant increase from the poor Q2 release. Both have been updated since the employment report. Another month of solid job growth means that the we are adding more jobs than needed to absorb the natural increase in the labor force. We can also see strength in the labor force from some less-often discussed numbers such as the quit-rate which has increased 9% over the last 12 months and the number of job offers, which is at a high for the recovery. These series can be seen in the JOLTS report put out by the Bureau of Labor Statistics. On the other hand, there are still signs of higher levels of labor market slack than we would normally expect late in the cycle. The chart below shows unemployment (the headline number) and underemployment. 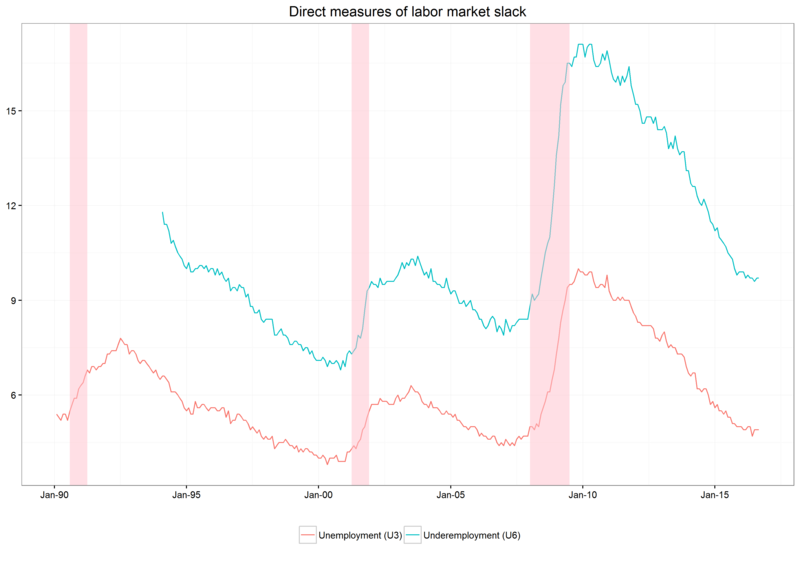 While unemployment is fairly low and roughly at the level targeted by the FOMC, underemployment shows significant additional slack in the labor market. 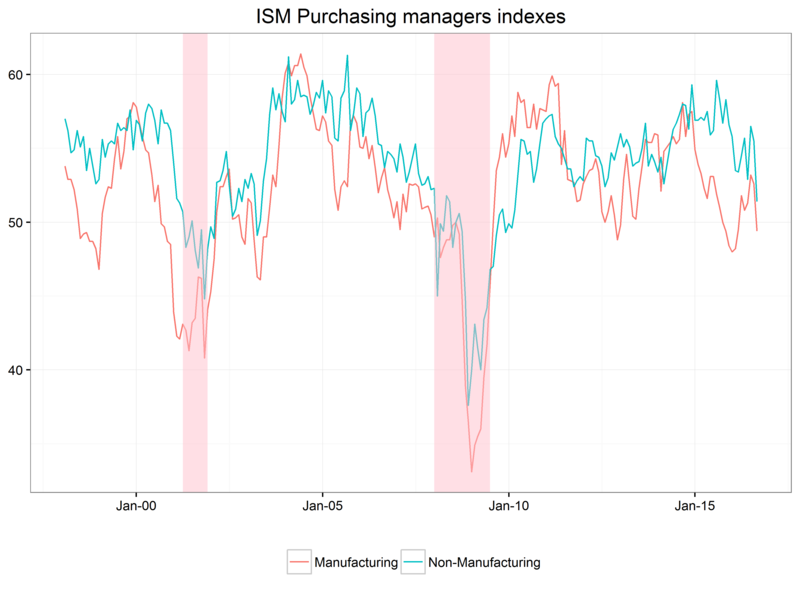 The latest purchasing managers surveys from the Institute for Supply Management (ISM) were disappointing. The manufacturing index gave up much of its gains for the year. 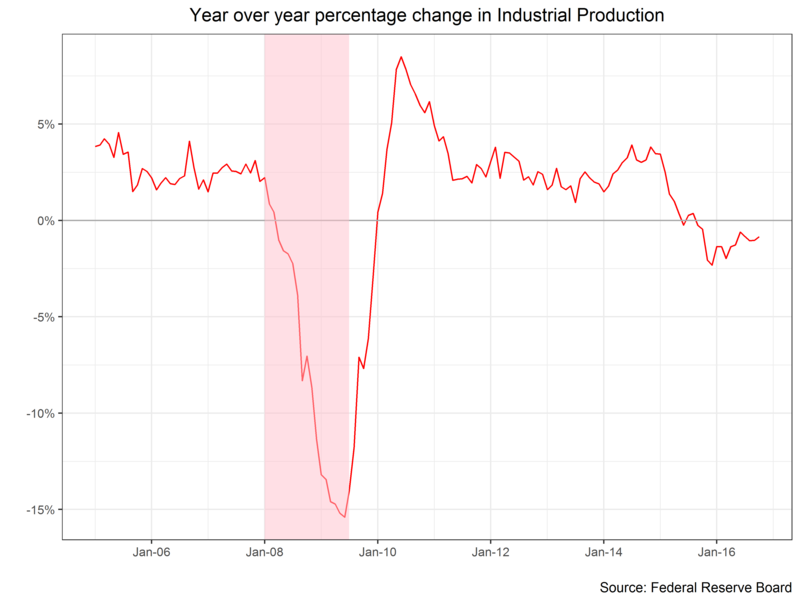 I hope this is not a harbinger of renewed manufacturing weakness such as we saw in the first quarter of this year. Surprisingly, non-manufacturing survey was also quite weak in August and it’s at the lowest level of the recovery. A diffusion index (such as these) is a bit challenging to interpret exactly and a glance at the chart will show many months spike up or down without signaling sustained shifts in growth. Digging into the details of the reports we see that much of this month’s weakness was due to drops in new orders and non-manufacturing exports. This will bear close watching in coming months. The hawks at the Fed seem to be getting louder, and one month’s survey data is, in my opinion, unlikely to deter them. See this speech by San Francisco Fed President John Williams who makes the argument that 1) because the unemployment rate is low the Fed will need to raise soon and 2) better to raise sooner by less rather than later my more. I see both those assertions as questionable (see Tim Duy for an argument about why it might make sense to let the unemployment rate drift lower) but I think a hike is coming in September or December assuming growth stays on its current course. For what it’s worth, my interpretation of Fed Funds futures prices shows that the market places a low possibility of a September hike but a likely hood of December hike. Overall, the economy continues its pattern of positive but modest growth. The ISM numbers make me a bit worried about the fall. As always I will be monitoring developments in the US economy carefully in the weeks ahead. Clients are welcome to get in touch for a detailed conversation.